THE IRISH DEFENCE Forces have carried out controlled explosions on dangerous chemicals discovered in two schools in Dublin and Cork today. The Forces’ Army Bomb Disposal Team was called to Grange Community College in Donaghmede, Dublin just after 2pm this afternoon after a quantity of 2, 4-Dinitrophenylhydrazine was discovered. 2, 4-Dinitrophenylhydrazine is a chemical reagent which is found in laboratories. It is relatively sensitive to shock and friction and can become unstable over time if it crystallises. The quantity of the chemical was removed from the school to a safe location, where it was destroyed by means of a controlled explosion and the scene was declared safe at 3.30pm. 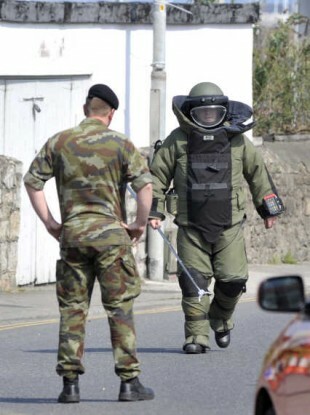 In a second incident, the Army Bomb Disposal Team was called to St Mary’s Secondary School in Macroom, Co Cork at around 3pm after another quantity of 2, 4-Dinitrophenylhydrazine was discovered. Again, the chemical was removed to a safe located and destroyed by a controlled explosion. Today’s call outs were the 185th and 186th this year, and the 20th and 21st involving what the Defence Forces call “substances of concern”. Email “Bomb squad carry out controlled explosions in Dublin and Cork schools”. Feedback on “Bomb squad carry out controlled explosions in Dublin and Cork schools”.